This year’s 21st edition of the 4+4 Days in Motion International Festival of Contemporary Art moves into the unused Municipal Buildings in the very center of Prague. 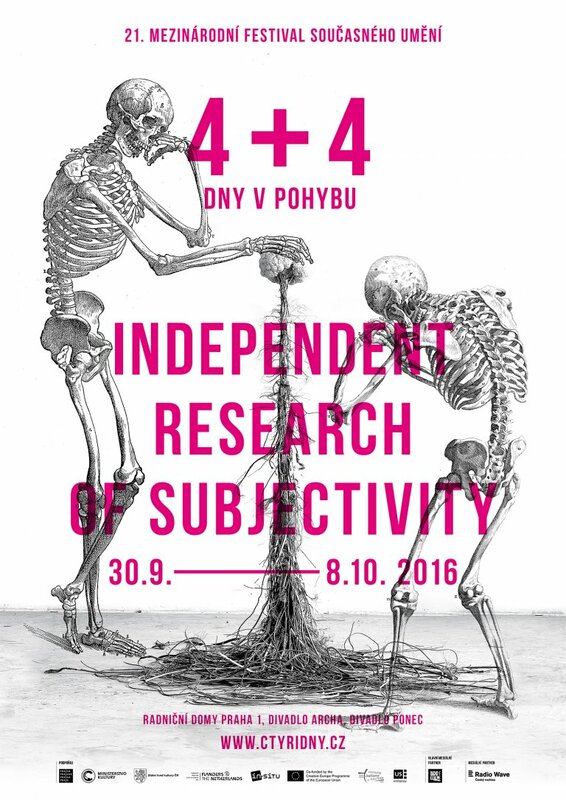 From 30 September to 8 October, the empty buildings next to Franz Kafka Square will host an extensive exhibition by 50 artists – sculptures, paintings, installations, and photographs selected by curator Pavlína Morganová on the subject of The Independent Research of Subjectivity. The Municipal Buildings will also host the premiere performances of various theater projects, public discussions with experts, guided tours, and children’s workshops led by renowned Czech artists. Besides making use of abandoned and decaying buildings, the festival also focuses on new provocative and innovative artistic projects across a variety of genres, but primarily in dance and theater. Another traditional part of 4+4 Days in Motion is foreign performances representing the most interesting of what contemporary international dance and theater has to offer. Seven foreign ensembles will appear on the stages of the Archa Theatre and the Ponec Theatre as part of the festival. The festival’s foreign program opens on 1 October with Israeli dancer and choreographer Arkadi Zaides and his provocative activist project Archive. Slovakia is represented by Divadlo SkRAT with Extracts and Substitutes, which won the Grand Prix and the Audience Award at this year’s prestigious New Drama Festival in Bratislava. Other guests include Italian artist Alessandro Sciarroni with his choreographic meditation Untitled, Dutch performer, musician and visual artist Julian Hetzel with I’m Not Here Says the Void, the first Prague appearance of young Flemish artists Robbert & Frank, whose performance Window of Opportunity was produced by the famous Campo arts center. North America is represented by Canadian choreographer and performer Dana Michel and Yellow Towel, and the main festival attraction is New York artist Andrew Schneider’s performance of YOUARENOWHERE, for which he received a 2015 Obie Award. The 4+4 Days in Motion festival was founded in 1996 by Nikola Böhmová, Markéta Černá, Denisa Václavová, and Pavel Štorek, who continue to organize the festival today. In its 20-year history, the festival has presented more than 400 Czech and foreign ensembles or individuals engaged in all areas of contemporary art (theater, dance, music, fine art, film, video art). Through its cultural projects, the festival has brought to life places such as the old sewage treatment plant in Prague-Bubeneč, the abandoned ČKD Karlín factory halls, the former municipal brewery in Holešovice, an old brickworks in Šárka Valley, the HC Hvězda hockey stadium in Vokovice, the Tyršův Dům gymnasium, the Nostic Halls, the former Federal Assembly, the former Casino in Pařížská Street, the former Center for Folk Art Production building (ÚLUV) on Národní třída, the Stýblo Palace on Wenceslaus Square, and the Desfours Palace. The festival has initiated the creation of numerous premiere site-specific projects by Czech artists, presents group exhibitions by contemporary artists and curators, and collaborates with leading art historians and architects to hold public walks and lectures. The festival also has a long history of working with various cultural organizations, including Kruh, Jednotka/Unit, the Academic Research Centre of the Academy of Fine Arts, and Start Vršovice, among others.